"But didn't you hear? I need clients so I don't wanna spend money!" Um, ever heard that saying you need to spend money to make money? Yeah, we're gonna do that. We're not going to spend out money like a drunken sailor though. Go place yourself a Facebook ad. Either place a "Like" ad to get targeted followers on your Facebook business page and start building engagement and relationships that way. Or go place a Facebook ad where you target your clients based on their location, interests and either pimp your design services, a special or preferably to get them on to your email list. I'll say that it is rare to get a sale for design services directly from an ad without having a relationship built, that's why getting them on your email list makes the most sense. And last, don't forget placing an ad on a sidebar of a DIY blog. They have large audiences who are interested in decor and while some of them think that they'd love to DIY, maybe they really want the help of a pro like yourself. You can sell some digital design services like picking paint colors for clients or creating an inspiration board. Go do a bit of research to see what others are doing and see if there's a gap in what's being offered. Etsy is a good place to get really specific in what you offer, think style or time period specific design help. People are always a good resource to help you get clients. Ask past clients or friends for referrals. You can start your own (which I don't recommend anymore) Facebook group or better yet, find a Facebook group filled with people who are looking for decor help or are talking decor. Answer their questions or strike up a convo. This doesn't mean give free advice forever. Just a simple tip may go along way to forging a relationship. 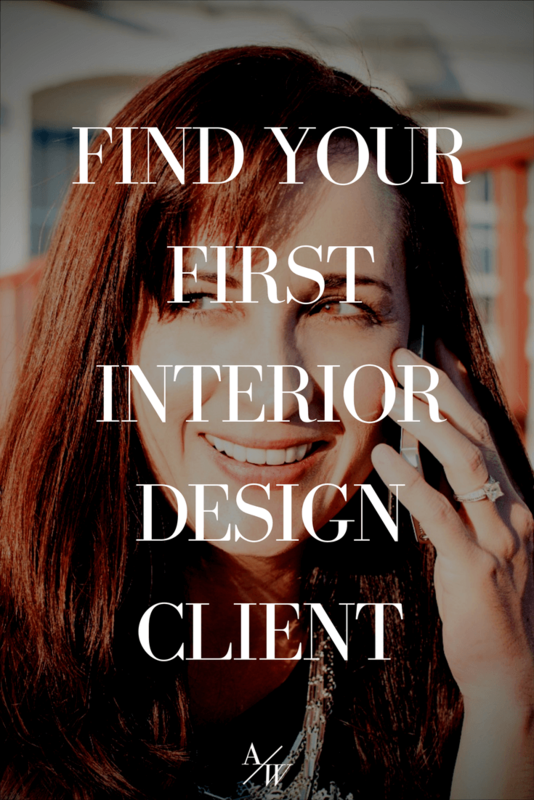 Pick a platform like Pinterest and create a board filled with your interior design tips and those tips can lead back to your design service page on your website. Find a local paint store, furniture store or community center to hold a workshop. In exchange get their email address (with their permission) and let them know you'll send them a Free Goodie related to the Workshop as a thank you for attending. While I'm not a fan of guest posting because of the time it takes a person like me (foul mouthed/non-PC person) to find a place that would be a good place for me to share my expertise, you'll probably find this to be an easier job. While some designers are terribly opposed to having guest posts on their blog because they fear competition, see if there isn't a companion designer you could partner up with. Like if you're a color expert maybe you could partner with a kitchen designer. See? Lovely pairing. Okay, don't stalk, but do a search on Twitter for people who a decorating their home and strike up a convo. Share a tip, be a friend. Writing a long and detailed blog post using one of your keywords can help you to bring in some new clients and more clients in the future. Speak to an evergreen topic (not a trend) and teach them how to do something. Leave nothing out. I don't mean teach them how to decorate an entire room, but rather how to style a coffee table. I wouldn't want you to give away everything. Of course, with that being said, you could totally still tell them how to decorate their bedroom in a series of blog posts and that doesn't mean they will have the skills to do it correctly. You could hold a webinar or teleseminar to teach them how to do something while you collect email addresses of your attendees. Then you could later turn that into a Freebie (or passive income digital product). Booyah! Some of these ideas are for the short term and long term. You need to constantly market your business and get people excited about your business. So which of these ideas are you going to try?